1010 Common (formerly the Bank of New Orleans Building), located at 1010 Common Street in the Central Business District of New Orleans, Louisiana, is a 31-story, 438 foot (134 m)-tall skyscraper. The building is adjacent to the 14-story Latter Center Garage & Annex. 1010 Common has architectural features of the late Art Deco and Nouveu period though it is a revival since it was built in the 1970s. 11 Stanwix Street (formerly the Westinghouse Tower) is one of the major distinctive and recognizable features of Downtown Pittsburgh, Pennsylvania, United States. The tower was originally built and named for the Westinghouse Corporation. Tenants today include IBM, law firm Cohen & Grigsby, advertising firm Brunner, and the local headquarters for First Niagara Financial Group. 11 Stanwix Street was completed in 1970 and it has 23 floors. It rises 355 feet or 108 meters above Downtown Pittsburgh. 28 State Street is a modern skyscraper in the Government Center neighborhood of Boston, Massachusetts. Built in 1970, it is Boston's 16th-tallest building, standing 500 feet (152 m) tall, and housing 40 floors. The building has a rectangular footprint which is then setback once near the top floor. The tower does not have a crown and in fact has a flattened roof. It was designed by Emery Roth & Sons and Edward Larrabee Barnes Associates. 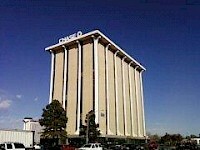 The Chase Tower, is an office/bank building in Englewood, Colorado. The first floor includes retail along with the Chase bank branch. 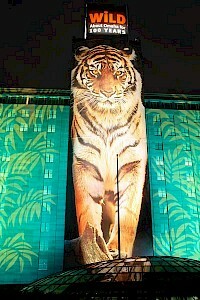 The Daniel Building is a 20 story, 238 foot (86 m) office building located in downtown Birmingham, Alabama. 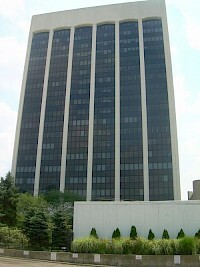 Built in 1970, the building originally served as a regional office for the engineering and construction company Daniel International. It also served as the corporate headquarters for Daniel International's real estate division, Daniel Realty, which today is known as Daniel Corporation. In 1993 Compass Bancshares bought the building from Daniel Corporation. Five Penn Center is a 36-story highrise in downtown Philadelphia, Pennsylvania. It is part of the Penn Center complex designed by Edmund Bacon. The building was one of the tallest in the city until the highrise building boom of the late 1980s and early 1990s and is connected via underground concourse to Suburban Station, as are all buildings in the complex. It was designed by Emery Roth & Sons and Vincent G. Kling (who also designed the Philadelphia Mint). 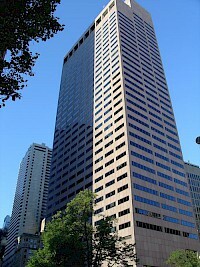 The Midland Building is a 280ft (85m) tall skyscraper located at 250 East Broad Street, Columbus, Ohio. 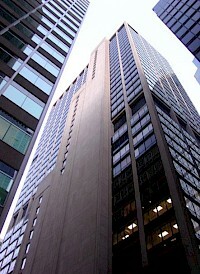 The office building was completed in 1970 and has 21 floors. Thomas E. Stanley designed the building, which is the 19th tallest in Columbus. 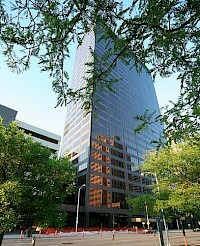 The Mutual of Omaha Building is a 285-ft (87 m), 14-story skyscraper in midtown Omaha, Nebraska, United States. Built in 1970, it is currently the sixth tallest building in Omaha. The building houses the headquarters of Mutual of Omaha Insurance Company, and is the largest building in Mutual of Omaha's Midtown Crossing development. Joined to the main building, the Mutual of Omaha Dome is an underground facility topped by a large glass dome.